Bad movies,good music and great hockey! Buddy! Was just going through old messages and saw one from ya, dont be afraid to come back and visit the forums! Woke up in the middle of the night to see this. So it wasn't a bad dream. Just to be clear, Babs - we're not losing 'cause Sammy didn't play. Horrible trade by the Caps. Forsberg will be a star in a few yrs and Erat? Probably retired by then. I'd say Kenny should look into the + 20yr -olds that are not playing their best atm for whatever reason, but who still have potential. For every Turris, Voracek, Tlusty, Hodgson etc. there's still Wolski's around, so it can be a bit of a crapshoot. Kimmo Timonen with his 1000th NHL game tonight, Will check that out for sure. No GM in their right mind would claim Cleary. So maybe Mr. Snow? So teams still do stupid trades from time to time, like they've always have and there's no reason why Kenny can't be on the right side of one someday. Missed the Blues game, so excited for this one. Prime time too (puck drop 9pm here). Gotta bring it, but think we'll be able to take this, say 4-3. Go Wings! Iggy with his usual 3 pt night & Hudler will of course score, but we'll take it 4-3. By wanting it more. Go Wings! If my memory serves me correctly, it's serious payback time. They shouldn't have any problems being fired up for this one. 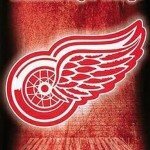 Go Wings! 14-3! Damn it, edicius has that taken care of already.